Bloomberg News reported on Sunday that Saudi Arabia’s Public Investment Fund is interested in participating in a potential Tesla Inc. buyout for up to $82 billion. The Sovereign Wealth Fund Institute, which tracks stock purchase by national funds, reported on August 7 that J.P. Morgan had helped Saudi Arabia’s Public Investment Fund acquire between 3 and 5 percent of Tesla’s shares for between $1.7 to $3.2 billion. With Tesla’s board of directors scheduled to meet with financial advisors next week, sources told Bloomberg the Saudi kingdom, through its sovereign wealth fund, is exploring strategies to participate with other investors and Tesla CEO Elon Musk in a potential transaction to buy all Tesla public shares and take the company private. Musk, in the middle of a stock trading session on August 7, shocked Wall Street when he tweeted: “Am considering taking Tesla private at $420. Funding secured.” By the end of the trading day, the tsunami of Tesla (TSLA) buy orders had sent the market capitalization of the company’s shares up by over $7 billion. The U.S. Securities and Exchange Commission (SEC) quickly announced it would be examining if there was a factual basis for Elon Musk’s tweet, or if it was meant to manipulate the stock price higher. The SEC is also reviewing the basis for Tesla’s public disclosures regarding sales, manufacturing and prospects. With Musk owing 20 percent of Tesla shares and having his net worth increase by about $1.4 billion, Bloomberg reported that two separate shareholder class-action lawsuits were filed in the San Francisco federal court on August 10 claiming securities violations. One suit claims Musk and the company committed fraud in a “short squeeze” scheme to drive up Tesla’s stock price higher. The other suit claims that with media reports confirming the dozen banks and investor funds usually involved in Silicon Valley tech deals were not committed to fund a Tesla buyout, Musk’s tweet was false and dishonest. 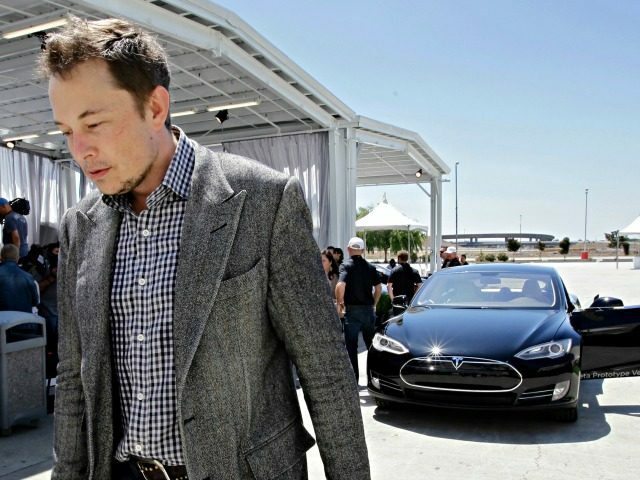 Elon Musk issued a string of derogatory tweets over the weekend demeaning big hedge funds like Greenlight Capital, managed by David Einhorn, and Kynikos Capital, managed by Jim Chanos, that have sold short Tesla shares hoping the company financially fails. In a reference to short sellers losing by betting against Tesla’s stock, Musk posted: “What are your fav short shorts?” Musk followed up with a promise to soon be offering authentic Tesla “short shorts” on the company’s merchandise website. Breitbart News reported in mid-July that Tesla’s financial performance might be about to improve based on an analysis by Munro & Associates that specializes in analyzing the design costs and profitability of vehicles by doing complete teardowns. Munro found that Tesla had made phenomenal improvements in design costs, battery costs, and electronics packaging for its Model 3 sedan. Munro shocked the auto industry by claiming design manufacturability improvements positioned Tesla’s $35,000 base Model 3 to achieve 30 percent profit margins and attain big production volumes.